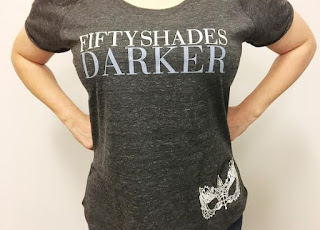 Win A Fifty Shades Darker T-Shirt! Want To Win A Fifty Shades Darker T-Shirt? We’re so excited about the release of Fifty Shades Darker on Blu-ray & DVD May 9, 2017, to celebrate we are giving away a special t-shirt designed just for fans. @FiftyShadesFilm is giving away a limited edition tshirt #OfficialFifty #AD"
Tweet it, Instagram it, post it to Facebook! Don't forget to attach the picture of the shirt and TAG US @FiftyShadesFilm. That's it! Couldn't be easier. The more you post, the more entries you'll earn. Worldwide entries are accepted! The deadline to enter is Sunday, May 14th at 9:00 p.m. PST, so hurry and enter to win!